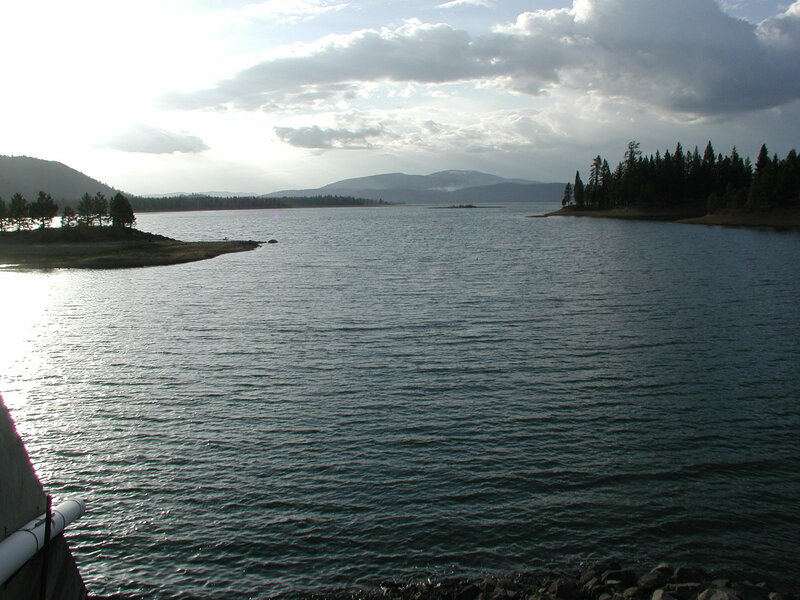 Lake Davis is one of California's or even the west's best trophy rainbow fisheries. Less than an hour from Reno, NV and only two hours from Sacramento, CA, Lake Davis produces many large "hot" rainbows every year. Built in 1966, Davis is a relatively shallow lake (reservoir) that is accessible year round with great fly fishing from late March until freeze over in late December and early January. Until the snow melts on the road going around the lake, wading and float tubing is limited to the south end of the lake and some open areas on the east side. One of the great bonuses of this lake is the prohibition of jet skis and water skiing so most of the people there are fishing and reasonably considerate. It is good to call one of the local businesses (listed later) or check this web site for access information. The shallow coves and long points on the west side of the lake are best for fly fishing. These areas hold the majority of the aquatic insects and vast weed beds that are more conducive to fish taking artificial imitations. There are times when the coves and points on the east side are productive, but this is usually very limited. More on specific spots to fish will be discussed later. The most exciting time of the year to fish is usually in May and lasts until sometimes the end of July. This is the famous damsel fly hatch that brings large rainbows (averaging two plus pounds and sometimes reaching as much as 6 or 7 pounds!) into the shallows and surface cruising for the nymphs and sometimes adults. The fishing can be nerveracking with many large rainbows slashing the water containing thousands of migrating nymphs trying to reach shore or some vegetation to hatch. You only hope they take your imitation along with the other "real" food. At the same time, blood midge hatches, mayflies, snails, scuds, caddis flies, dragon flies, leeches, and even flying ants provide good action when the damsels are slow. Evenings and early mornings provide some exciting midge fishing with some of the blood midges reaching size 10! At dark, the fish get careless in pursuit of egg laying midges and pupae in the surface. Ironically, most fly fishermen have left the water long before the evening opportunities. In mid October until the snow prevents access, Davis can provide the best fishing of the year in terms of numbers. There is little hatching, but a tremendous snail migration and the onset of colder weather get many large fish on the bite. Wading the points and shallows can produce lots of action for the persistant fisherman. Note* These are general times and depend on weather, temperature (both outside and water), and water conditions. Call ahead and ask local sources. I will try to keep a current synopsis on the web. 4 to 6 wt rods and lines. Longer rods are easier to cover more water. Floating and intermediate lines. Sometimes a type 2 sinker is very effective when fish are deep. Nine foot 3 to 5x leaders, with 3x to 6x tippet. (Most of these fish can easily break off even 3x tippets when on the damsels!) Waders, boots, vest or chest pack, net (large if you got one! ), hat and both cool and warm weather clothes, lotions and sundries. (If not wading) bring a float tube, pontoon boat, pram, canoe, fishing boat, etc. That will help you cover more water and give you more opportunites. Sometimes the fish are in different places on different days! I like to use a boat and my waders to be as versitile as possible. The wind can be tough in the afternoons, so bring a good anchor system. In fact, if you use a pram or boat, bring at least 2 anchors. Larvae, pupae, and suspended emergers, and adults. Sizes 16 to 20 in black, tan, green, red and brown. Sizes 12 and 14 in blood midge colors. Include a few brassies and thin PTs in sizes 14 to 18. Callibaetis nymphs, energers, cripples, and drys. Light gray to tan in sizes 12 to 18. Paranymphs can be deadly if the fish are on these mayflies. Use mostly nymphs, both weighted and unweighted (preferred) and have a wide variety of sizes, colors, and patterns. The nymphs will run from dark olive and brown to an almost mustard yellow-brown. Carry sizes 8 to 16 becasue the size varies greatly too. These fish can be picky, so don't be afraid to change bugs until you find the one that works. Have a few tenerals in tan and blue along with some adult patterns. Snail patterns, Sheep Creek Specials, Pheasant Tails, Prince Nymphs, and leeches will round out your box. Wooly and crystal buggers, Staner Ducktails, Stimulators, Stillwater Nymphs, and other popular attractor patterns are good to have along. Note*- if you tie, bring your kit, you may not be able to get what you need locally. Besides, it is more fun to catch fish with your own flies. Great campgrounds available right on the lake as well as a general store with a frosty to help with some comfort food close to the lake. The store has campgrounds available as well as good advice and supplies.Get in touch with the store at (www.grizzlystore.com or 530-832-0270). There are also some good hotels and excellent restaurants in town about 5 miles away. Fish the entire west side of the lake in shallow coves and off points where weedbeds are visible. In particular, concentrate on the areas north of Camp 5 boat ramp all the way up to Freeman creek. Jenkins Point, Cow Creek, and other access spots from the west side road are all excellent. The fish will move to areas of highest food density and you need to be adaptable. Be aware that some weed beds are a good distance from the shore and wading may preclude you from reaching the largest concentration of fish. In the evening, the south side of Eagle point can be very good for Blood Midge hatches. Call ahead, drive around, ask, be observant and ask at the store. Many fish are caught in very shallow water, so pay attention, don't wade in without first casting in the shallows! This is a large body of water and can be frustrating, try to collect as much information as you can before getting to the lake, then collect more before you begin fishing. Free maps are available at the store and local shops in the region. I will try to have a downloadable map on this site soon. Hopefully one that does not take an hour to load.